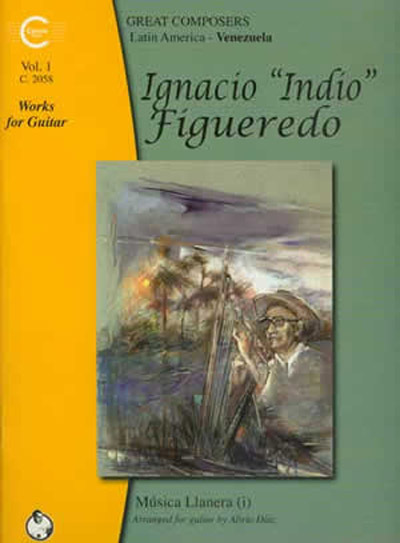 Presents solo guitar arrangements of three engaging tunes by Venezuelan folk harp virtuoso Ignacio “Indio” Figueredo (1899-1995). Written in standard notation only. Recommended for the intermediate to advanced classic guitarist. These works were originally composed for the Venezuelan Llanura (plains) folk harp, the arpa criolla, which plays an important role in the music of this region. Although unable to read or write, Ignacio “Indio” Figueredo, the most famous player of this instrument, composed over 300 pieces. This deluxe edition presents Alerio Diaz’ masterful guitar arrangements of “Los Caujaritos”, “Mi Camaguan”, and “Priva Resuello” complete with historical and performance notes in English, Spanish and French.